Who doesn’t like a refreshing cold drink in the summer? I know I love it on hot days like today. Problem is, most store bought mixes are laden with processed sugar and chemicals. Take a look at the ingredients in this Country Time Lemonade that I got off their website. Did you notice how there are no actual lemons in the ingredients??? There are, however, lots of other unwanted additives. I have highlighted some of the nastier ones. Ingredients: SUGAR, FRUCTOSE, CITRIC ACID, CONTAINS LESS THAN 2% OF MALTODEXTRIN, NATURAL FLAVOR, ASCORBIC ACID (VITAMIN C), SODIUM ACID PYROPHOSPHATE, SODIUM CITRATE, MAGNESIUM OXIDE, CALCIUM FUMARATE, SOY LECITHIN, ARTIFICIAL COLOR, YELLOW 5 LAKE, TOCOPHEROL (PRESERVES FRESHNESS). CONTAINS: SOY. GMOs. This is easy to make and much better! If you don’t want a drink, you can make these into popsicles using these molds . I made mine using a juicer , but you can use a blender and strain if you like, or just make it into a lemonade smoothie! I got the idea for this after I saw all the fruits that came in my co-op basket. If you are using a juicer , juice all ingredients except for the honey. Add 1-3 T raw honey or maple syrup depending on how sweet you like it. I personally love the tarty flavor. If you are using a blender juice the lemon separately. Add the rest of the fruit and the sweetener into the blender with the lemon juice. Blend for about 90 seconds. Serve immediately or store for later. I got about 32 oz of juice out of mine. Enjoy! 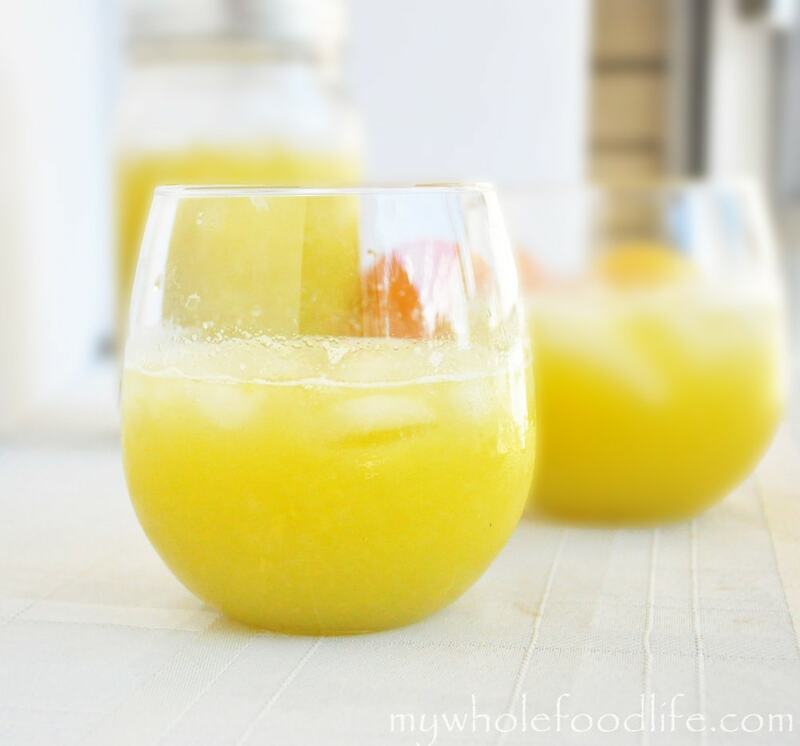 This looks so easy, refreshing and delicious! I just had the most amazing honey dew melon for the Fourth, so I am totally in a honey dew mood now! I can't wait to try this! Thank you! I hope you enjoy it. I got an awesome honey dew melon in my co-op basket recently. Super juicy and sweet. I love summer! I feel the same way. I bought a vitamix today with a lot of your recipes in mind. You will love the Vitamix! Congrats on your purchase. Inspiring. Just curious. What are your thoughts on a juicer? Just made this. I bought a juicer just for this recipe and to hopefully do more in the future. The fruity lemonade is wonderful. Grandkiddos loved it! Thank you for all your recipes, we love them. Hi Christina! I am happy you like the recipes! I would recommend getting honey at your local farmer's market. If that is not an option, just try your local health food store. They all should carry it and may even have a local option. Just looked at the ingredients on the lemonade I'm drinking (not a cheap brand) No lemons! Haha Looking forward to making this! Have you experimented with any other fruit in this recipe?